Jon Wertheim's French Open baguette: Opening day at the French Open saw Simona Halep, Kei Nishikori and Stan Wawrinka move on to the next round, while a security breach and Roger Federer's encounter with a fan on-court remained the highlight of the first day. The French Open organizers have taken this to heart. The lone major to wrap itself around three weekends, the 2015 tournament kicked off today….well, it didn't kick off, so much as it sauntered off, opening with typical French insouciance. A “soft launch,” the brand marketers would call it. 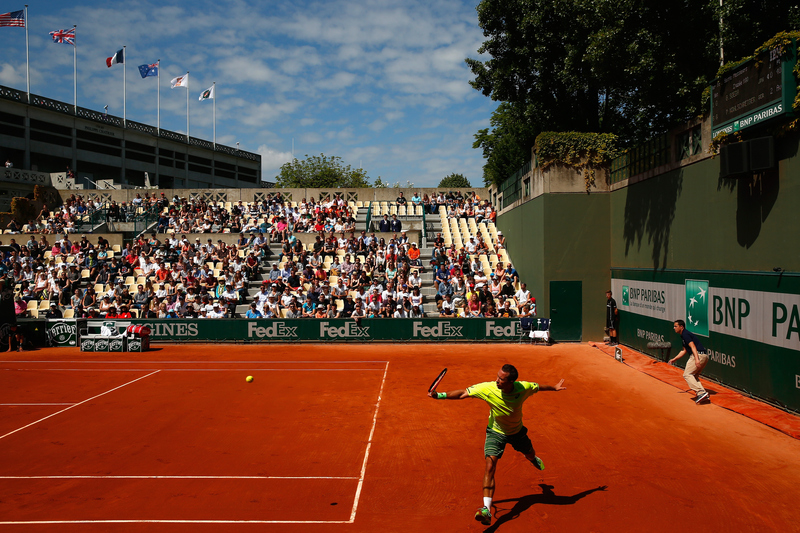 Under a sky split open with sunlight, the first slate of matches started at 11:00 a.m. and ended when the Parisian sun finally departed for the evening. Fans filed in, but without the energy that usually signifies the start of a major international sporting event. While there were no bold-faced upsets, there were bold-faced names in action. Hoping to replicate her success from last year, Simona Halep played through some rough patches and advanced over Russia’s Evgeniya Rodina. Kei Nishikori made like a locavore and feasted off Paris-based veteran Paul-Henri Mathieu. Stan Wawrinka exceeded his showing from last year by making it to the second round. He carved up Turkey’s Marsel Ilhan. Roger Federer played, too, surely ambivalent about the Sunday start. Most players are less than thrilled that the French Open—already the Slam that plays the lowest purses, albeit partially due to the flagging currency—has co-opted this additional weekend session. At the same time, Federer knows that, at this stage of his career and on this surface in particular, he can use all the breaks he can get. 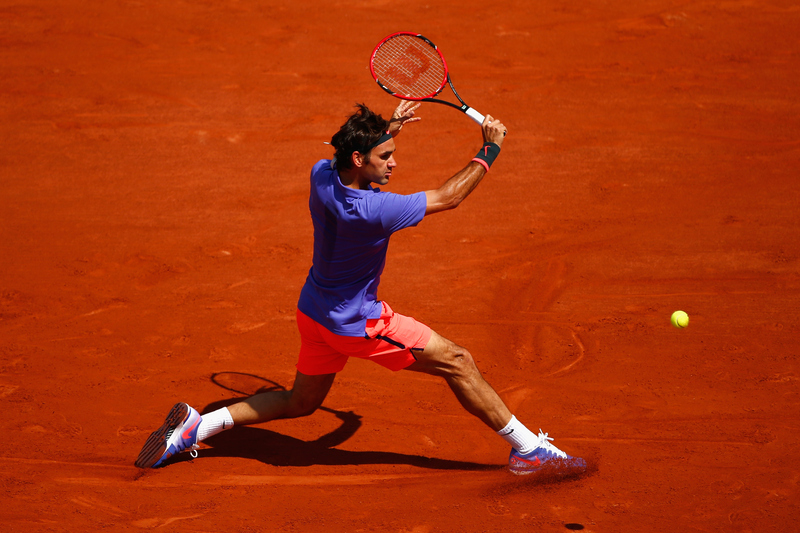 Elongating his schedule—he now has 14 days to win six matches—certainly works in his favor. ​Federer made quick work of Alejandro Falla—a lucky loser, if drawing the second seed in your first match qualifies as “lucky.” Mssr. Federer did get a spasm of unwanted drama after the match, as a fan walked onto the court and approached asking for a selfie. The trespasser took the photo before he was accosted. If players had the reaction times and footspeed of the security staff here, they wouldn’t make it out of qualies. As this unfolded, Rafael Nadal and Novak Djokovic were back at their hotels. On Sunday, they rested. • There are two Swedish men in the draw for the first time since 2008. • Signs, signs, everywhere there's signs No. 1: Rafael Natal won his UFC fight on the eve of the French Open. • Signs, signs, everywhere there's signs No. 2: Playing the French for the 11th time, Andre Agassi and Roger Federer won the career Slam. This is the 11th time Novak Djokovic has entered the French Open. • We talk about the dominance of the Big Four but consider this: no woman under the age of 25 has won a major. • Pity the folks at the Hall of Fame. Amelie Mauresmo is the lone former player to be inducted this year. Your French Open seed report made no mention of the gauntlet awaiting Novak Djokovic. If the seeds hold up, he would need to beat Nadal, Murray and Federer in successive matches. If Nadal plays anywhere near to form, both the Nadal and Murray matches will be long and punishing, whereas the hypothetical Federer-Berdych semifinal will have much quicker points. Even if Djokovic makes it to the final, will he be exhausted just getting there? • The underlying point: the FFT screwed up by not exercising their right to seed subjectively. Put Nadal at No.4 and all this is avoided. The draw evens out. We’re spared the Nadal-Djokovic quarterfinal (and de facto final) robbing the last few days of a climax. And no one is complaining that the guy who won this nine times over the last decade got some special dispensation at the expense of Tomas Berdych and Kei Nishikori. As for Rich’s question, we’ll see. But it’s good point either way. Even if Djokovic defeats Nadal, it will be a mentally taxing day. Then he has to come back and play Murray, the only other player undefeated on clay this year. Then he needs to play a major final and try and win the one Slam that has eluded him. Does he prefer this? Or a winner-take-all final against the opponent that has won this event nine times in ten years and beaten you all six times you’ve played in Paris? • This is one of the nicer—and uncharacteristically sensible—aspects to tennis. There is a real effort made to accommodate as many players as possible (and make sure fans and tournaments get a maximum number of matches.) Though the draw was made Friday, players can still withdraw. There are lucky losers on site waiting for withdrawals. In fact—and I just learned this—players can withdraw up to 15 (!) minutes before a match. Think of how disruptive this could be for the opponent. You’re preparing to play Opponent X and then suddenly you’re told that you’re getting Opponent Y instead. One open secret though: there are always players who are less than 100% physically. The decision: do I withdraw and given my spot (and prize money) to an able-bodied colleague? Or do I go out there in a compromised state and pocket my $30,000? • Win? Probably not. I like Kvitova. Many—including Lindsay Davenport—like Simona Halep. Serena Williams and Maria Sharapova are, obviously, your top two seeds and both past winners. I’d be very surprised if a player outside of that group won. We can all tick off dark horses: Muguruza? Gavrilova? Carla Suarez Navarro, inasmuch as the No. 8 player can be a dark horse. But, for all the talk of parity and a wide-open draw, the women’s game is top heavy. Nearly as much as the men’s. Consider this: no active player under age 25 has won a major. By my unofficial research this has never happened before. • The ITF announced that American broadcaster Mary Carillo will receive the ITF’s highest accolade, the Philippe Chatrier Award, at the 2015 ITF World Champions Dinner in Paris. • His new book GAME, SET AND MATCH: Secret Weapons of the World’s Top Tennis Players, Mark Hodgkinson collects unprecedented insights and tips from tennis’s greatest players and coaches including Pete Sampras, Steffi Graff, Chris Evert, Rod Laver and Serena Williams. • The Bank of the West Classic announced today that World No. 1 and defending tournament champion Serena Williams will return to defend her Bank of the West Classic title at Stanford University in August. 19-year-old American wildcard Louisa Chirico made her Grand Slam debut, losing to No. 9 Ekaterina Makarova 6-4, 6-2. 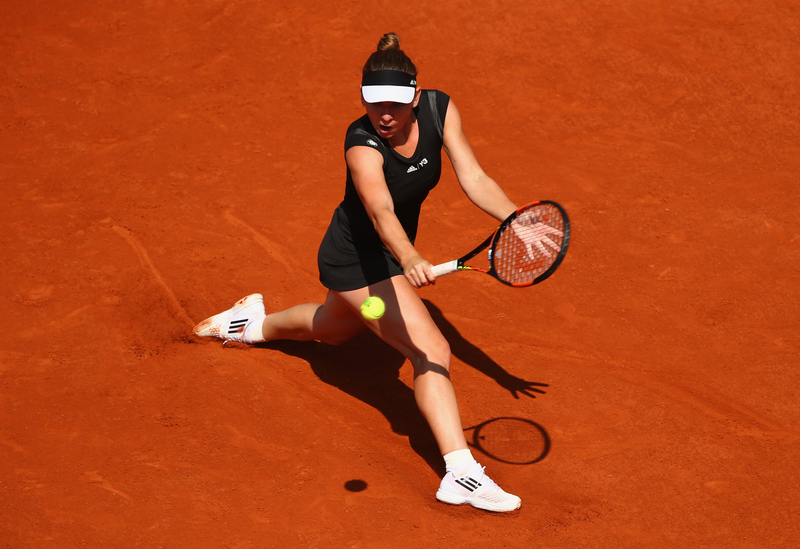 Simona Halep returned to Court Philippe Chatrier for the first time since last year's final, shook off nerves and beat Evgenya Rodina 7-5, 6-4. No. 22 Philipp Kohlschreiber lost just three games, beating Go Soeda 6-1, 6-0, 6-2. Roger Federer debuted some 80s style in a quick 6-3, 6-3, 6-4 win over Colombia's Alejandro Falla. No. 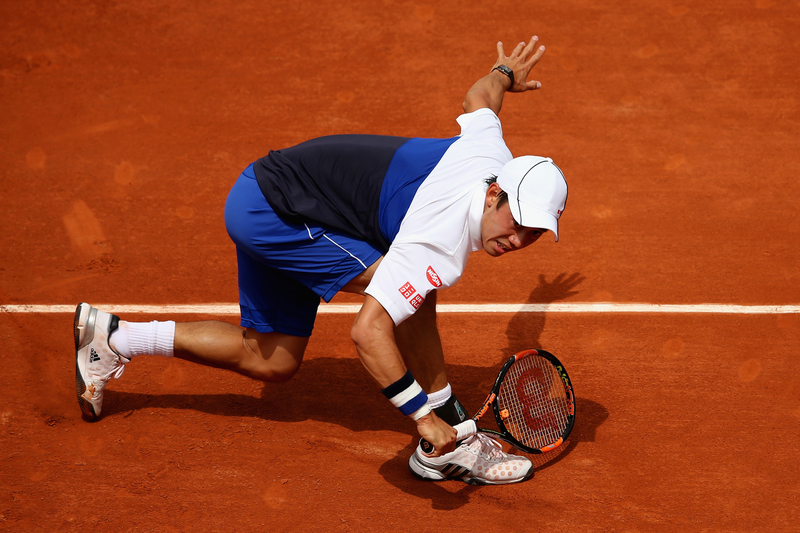 5 seed Kei Nishikori topped French wildcard Paul Henri Matheiu 6–3, 7–5, 6–1. Amelie Mauresmo and Andy Murray on court on another practice day. Murray opens his tournament on Monday. Cleveland's Lauren Davis pushed Mirjana Lucic-Baroni to three sets, losing 6-3, 3-6, 6-3. 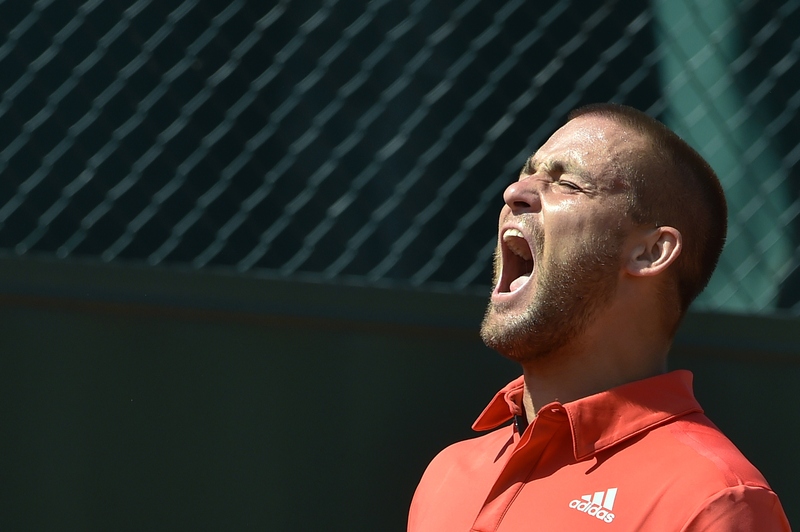 A frustrated Mikhail Youzhny screamed, broke rackets and then retired after two sets to Damir Dzumher. 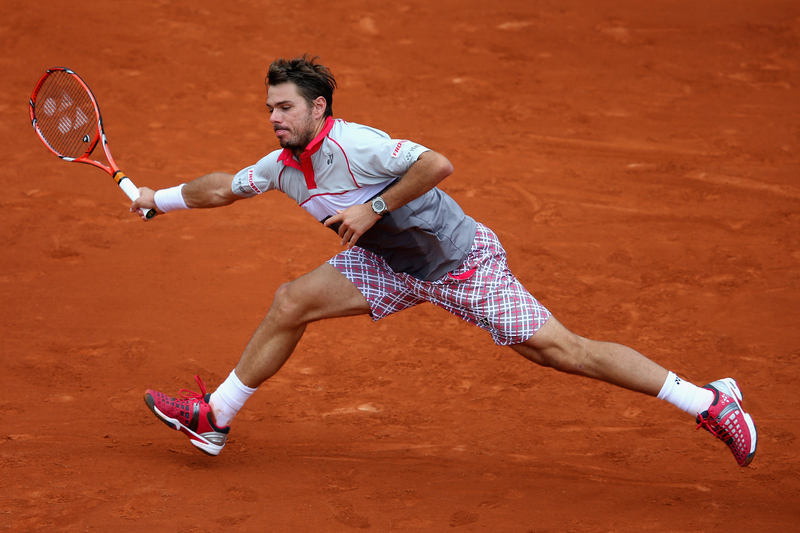 A first round loser last year, Stan Wawrinka put on a clinic to beat Marcel Ilhan 6-3, 6-2, 6-3. After tumbling down to No. 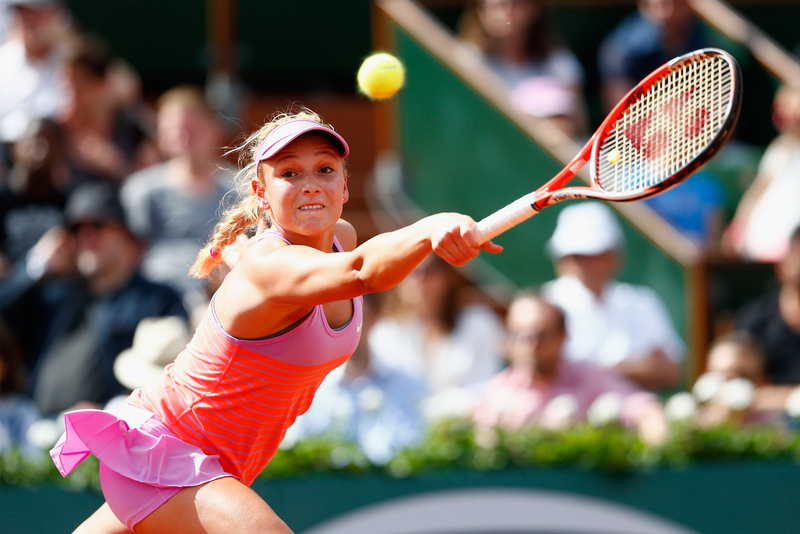 165, 18-year-old Donna Vekic found her best form to upset No. 31 Caroline Garcia.